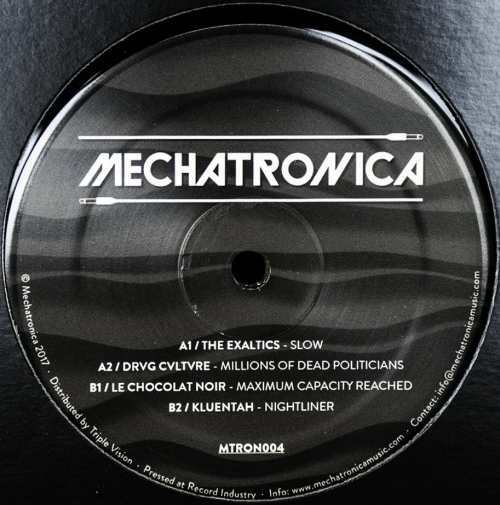 Incidentally I started Mechatronica’s new compilation with the B-side that stands for the sound the label from Berlin is much appreciated in the electro community. No real surprises, only pure quality: Le Chocolat Noir‘s “Maximum Capacity Reached” is literally an electro song with cyborg vocals and physically challenging bass sequences. Kluentah, a new artist to me, stays in the same wavelength when communicates unemotionally in machine language in the dark side cut “Nightliner”. When arriving to the A-side, I would not have guessed the label in a blind test because Mechatronica is discovering its wilder face here. Solar One Music boss The Exaltics comes with acid-soaked drum workout “Slow” that still finds room for blossoming pads. However, most intense statement comes from New York Haunted’s Drvg Cvltvre who drops with “Millions Of Dead Politicians” robust acid techno, coming over you as a swarm of locusts. It’s clearly the hardest track ever on Mechatronica and awakens fond memories of Vincent Koreman’s past as Ra-X. All that may herald a new direction for Mechatronica because another acid and electro combo is expected in the label’s next compilation.